Yesterday we celebrated Summer Pie Day. It is not a real holiday but one made up and eagerly anticipated by our family (and dare I say, friends). Simply, we invite family and friends to come over with a homemade pie and we eat. 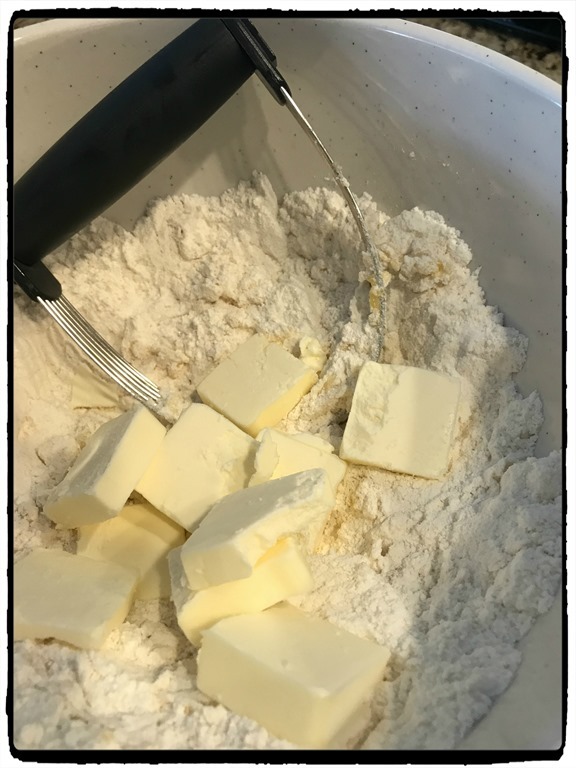 As I do each year, I try a new recipe. 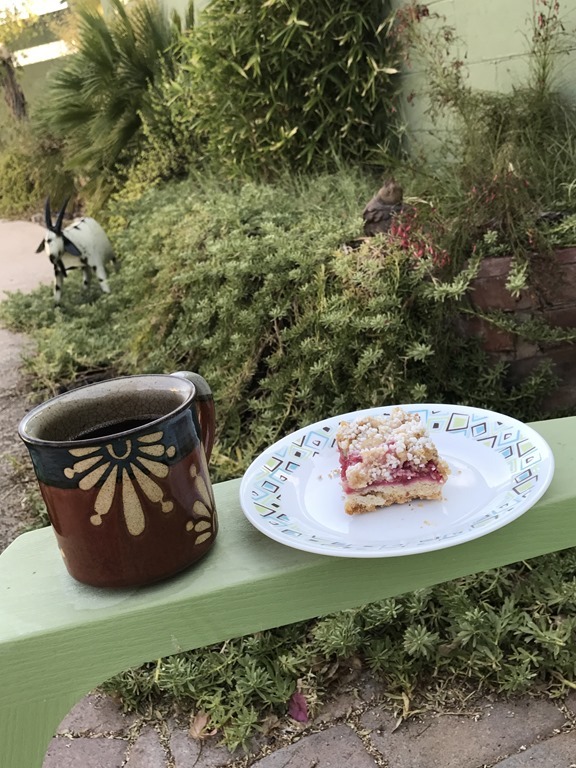 I made this delicious berry crumble bar. It called for pearl sugar, something I had never heard of and, I found, is rather difficult to track down. I called half a dozen places in town, panicked about it to Husband, who ordered it same day delivery from Amazon. Planning ahead would have been a good thing in this case. The boys participated in Summer Pie Day as well. 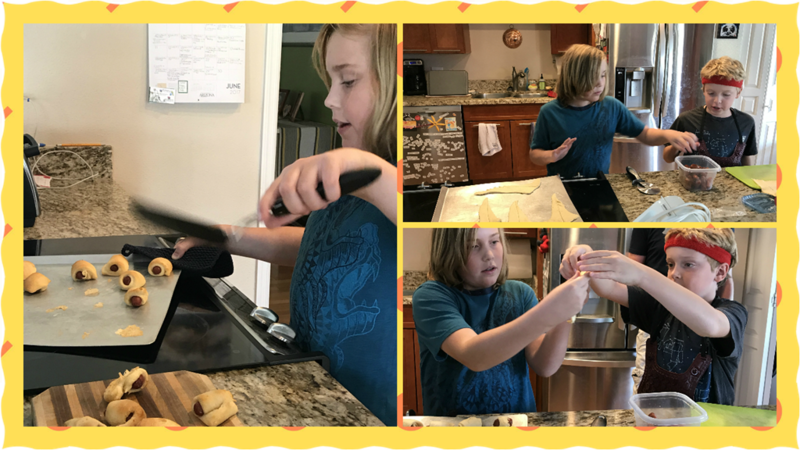 Carter, who usually makes chocolate pudding (not at all a pie), made his pudding but asked to put it in a graham cracker crust. For added flair, he topped it with whipping cream and sprinkles. You may notice the costume change. While licking the spatula, Carter ended up with a shirt streaked with chocolate. Also, note the body armor in the second picture with the finished product. 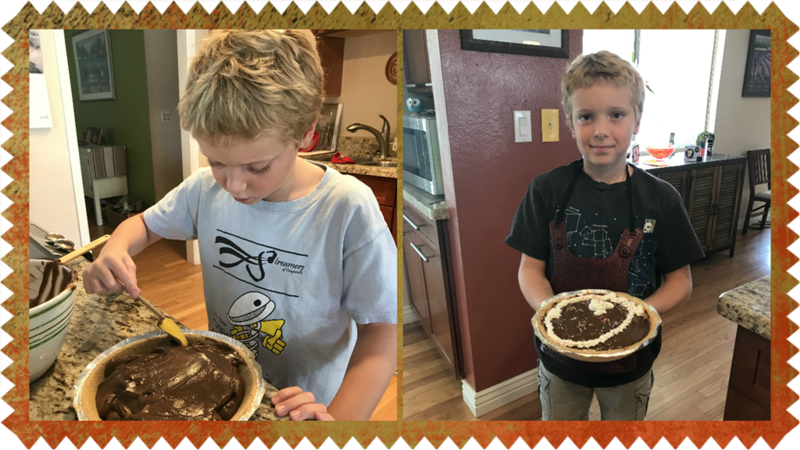 He took time out from planning and executing a Nerf gun war to make his pie. Cody, not one for pies, made pigs in a blanket. Carter, sporting his body armor and 80’s headband, made for a good helper. 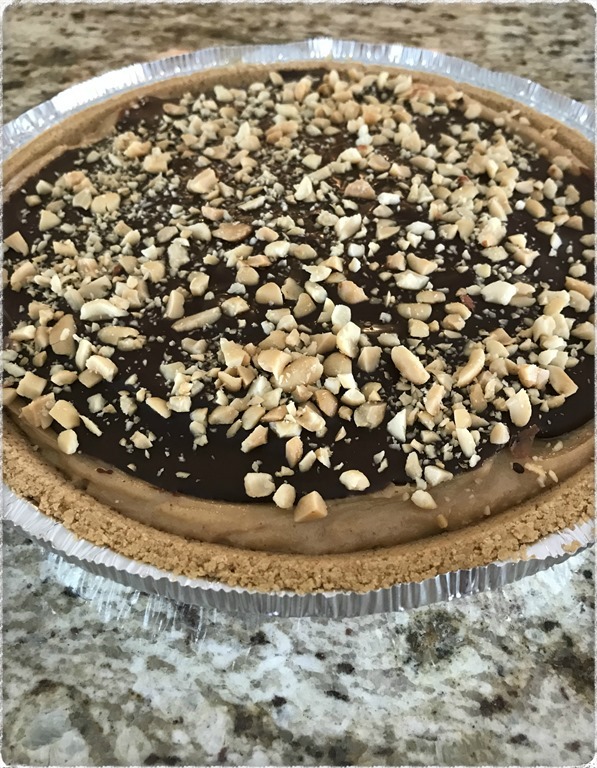 Husband, pressured by the boys (“But Poppa, it won’t be Pie Day without your peanut butter pie!”), made his usual. 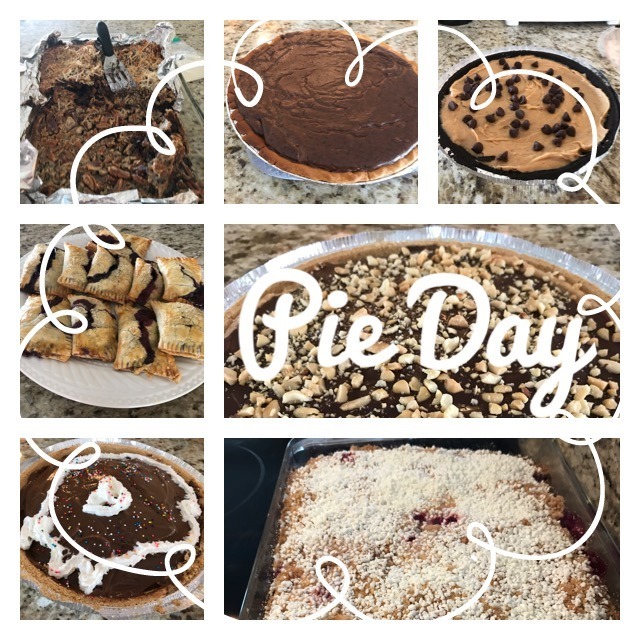 My favorite moment of any Pie Day is the lull in conversation as the guests dish up and begin to sample all the tasty hard work we all gathered together to share. And so another Summer Pie Day has come and gone, slices of leftover pie waiting in the fridge to be eaten. Lastly, I must apologize for the various collages, boarders, and colors. I am trying out a new photo editor, Fotor, and got a bit carried away. Care to share what photo editor you use? 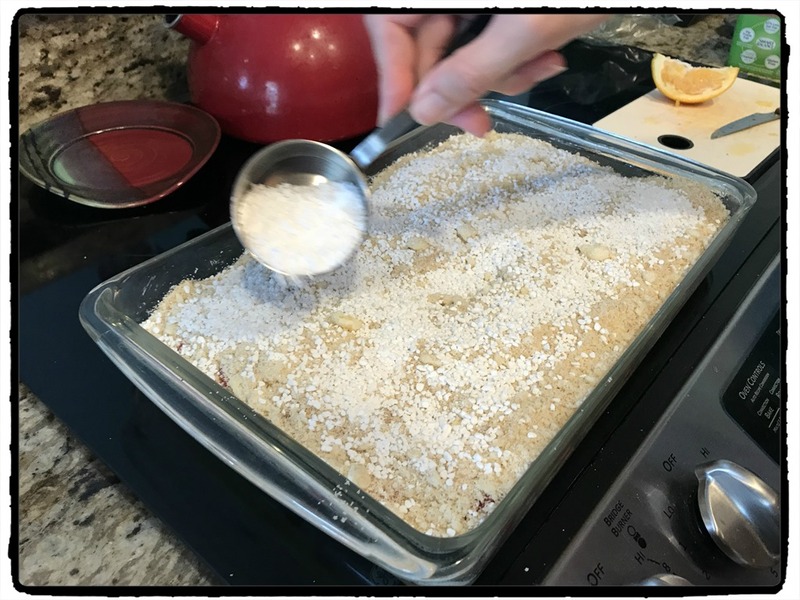 This entry was posted in Food Glorious Food, Simple Sunday and tagged Children, Cooking, cooking with kids, Family, Food, Friends, Holidays, Kids, Pearl Sugar, Photography, Pie, Pie Day. Bookmark the permalink. I also use Fotor for editing but for food photos I use Foodie. It was recommended in a magazine I read. It has been a fun, and delicious, tradition. Thanks for the recommendation of Foodie. I have never been happy with my food photos so I will definitely look into that. It was a very tasty day! I had no idea it was Pie Day! Ironically, we watched an episode of the show Monk, called Mr. Monk and the Three Pies. Same day! I hope that counts. 🙂 These all look delicious!